The idea for this week is a non-violent strategy game where you are the Gingerbread House Witch looking to take over the entire forest. You must decorate your house to lure children and convert them into mindless slaves who will make lollies for you and help you take over more houses. Watch out though, if you don't feed the children enough lollies they will turn against you. Many strategy games feature war and military tactics explicitly, making them undesirable for some children and parents. Gingerbread House requires the player to use strategies to maximise their resources (children), but does not allow direct attacks and the resources can turn against the player. The battle for the forest has begun! You are the witch of the Gingerbread House and you must build an empire based on luring children with lollies. Fatten the children until they turn into mindless slaves who will do you bidding and help make lollies, take over new gingerbread houses, and bolster your defences against other witches. Watch out! If you don't feed your children enough lollies they will turn against you and eat up your gingerbread house empire. 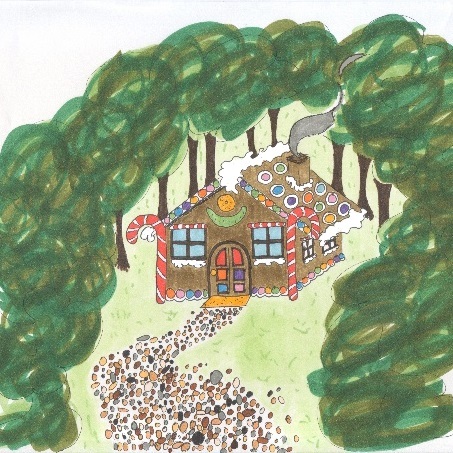 The game starts with a single gingerbread house nestled in the heart of the forest, fully decorated and with a supply of lollies. Decorations represent the "health" of the house and the lolly supply shows how many lollies are available for the children to eat. Only houses that are fully decorated will attract children. When children arrive, they must be fed lollies to plump them up so they will turn into mindless slaves after some amount of time. The ratio of lollies to lured children must be kept balanced (only children who haven't been converted to mindless slaves count). If there are many more children than lollies, then the children will start eating the decorations of the house until there are none left and the house is destroyed. If there are too many lollies in the house, the children will become sick from eating and the process of converting them into mindless slaves will happen more slowly. To keep the balance you must keep track of the number of mindless lolly making slaves in the house. Once you have consolidated your home base you can use your mindless slaves to explore the forest and find out where more children are living and where the enemy witches are hiding out. As you lure children, houses will empty and become available to capture. To capture a new location you move a mindless slave there and get them to start making lollies. This will build up the decorations on the house. Once the house is fully powered up with decorations, you will then be able to start luring children to the house and converting them into more mindless slaves. If another witch is close by to a gingerbread house you have captured, that witch can start luring away your unconverted children (the ones who aren't yet mindless slaves). When the witch has sucked up all the unconverted children, they will start draining the decorations from the house. Finally, when all the decorations have been taken, the mindless slaves will be lured away to go and work for the enemy witch, leaving the house empty. Luckily you can use these tactics against other witches: place a gingerbread house full of mindless slaves making lollies close to another witch and you will lure away their children until the house is empty. Note that, when you lure away children from another witch's house, you take them at their current conversion level (i.e. partially converted to a mindless slave or fully converted). Then you are free to move in and take over the house with your own or newly aquired mindless slaves, decorate it and start luring new children to the house. As well as exploring new areas and making lollies, mindless slaves can also build up a house to increase its size. This will mean it needs more decorations to stay fully powered up, but it will lure more children and be harder to fall into enemy hands. To change what a mindless slave does, the player clicks on a single slave or a group of slaves with the mouse and chooses between: make lollies, build up the house and move to a new location. Each house will be shown on screen with a pie chart showing how fully decorated it is and a bar indicating the current state of the lolly to children ratio. The decoration pie chart will be larger if the house is bigger. If the player clicks on the house to investigate further they will find out more exact information on the size of the house, the lolly supply, the mindless slaves in the house and their current roles and how far along the plumping up conversion process is for each lured child. Players will be challenged to balance luring more children and making sure there are enough lollies in their supplies. The game will be full of small successes and failures as houses are captured and lost. The player will be able to just see enough of the rest of the forest to have the feeling that they could continue for a little bit longer and capture a new area. Players will be forced to continue exploring as the available children in the area gets sucked up. Balancing all the factors will be essential to making sure the game plays well and is not too easy or hard. There might need to be a system of special events or powers that can be used to give the game more of a dramatic curve, particularly if the player is finding the game too easy.